This article originally appeared on License to Roam – A fantastic site covering football tactics and analysis. You can read the original here and follow License to Roam on Twitter. Much of the talk about Palermo this season has often centred around their Argentine starlet, Paulo Dybala. While this is completely warranted (he’s been outstanding), one man whose influence can’t be overlooked is his fellow countryman, Franco Vazquez. The 25-year-old Cordoba native has also been superb for the Sicilian outfit. In his 22 Serie A appearances he’s scored an impressive seven goals and supplied a brilliant nine assists. In addition, he’s also averaging 2.7 shots per game, 1.8 key passes pg and 3.4 successful dribbles pg, as his enterprising work in the attacking third has procured so much for his side. Incredibly, as per Whoscored, Vazquez finds himself equal first with Paul Pogba as the highest rated player in Serie A. Notably, he’s also first in the assist charts and equal top in successful dribbles (alongside Diego Perotti), in what’s been a remarkable campaign to date. Even more staggering is the fact that he leads Pogba in assists, goals, dribbles, shots and aerial duels. This illustrates just how good Vazquez has been, especially considering the Juventus star is widely recognised as the best player in Serie A. Always eye catching in his attacking play is Vazquez, but his defensive work is also good, and can’t be discounted. Despite this not obviously being his strongest point, he still averages just under two tackles and one interception per game. “It’s the same role I had in Belgrano, and it gives me a much broader range of play. “And I’m facilitated by having players like [Edgar] Barreto, [Paulo] Dybala and Enzo Maresca by my side,” he stated. In Palermo’s most recent fixture, a 3-1 blitzing of Napoli, the languid, elegant attacker was terrific again. Starting the match in his left central attacking midfield role, he moved well to find space, was sharp in possession, intelligently switched (left to right attacking midfield positions) with Quaison and had a hand in all three of his side’s goals – scoring one and setting up two. Achraf Lazaar’s blast from the best part of 45 yards was more down to Rafael Cabral’s howler than Vazquez’s assist, but he’ll still take it. His second goal resulting contribution was pure class, though, following a powerful run from Quaison down the right, who then lofted a delightful through ball into Dybala’s path. Upon receiving the ball, the 21-year-old looked up and waited for Vazquez to get into a position to receive the pass. Once Vazquez got there, his fellow Cordoba native rolled a precise pass to him at the edge of the box. All that was left was for Vazquez to finish, and he did so in glorious style – side footing the ball home into the left corner with his wand of a left foot. The move was fantastic, and the former Rayo Vallecano man completed it aptly. Lastly, the cushioned header he steered into the path of Luca Rigoni was out of this world. His aerial prowess is a somewhat underrated aspect of the 187cm playmaker’s skill set, but something he puts to good use – this passage was no different. Following Dybala’s wicked run, the Palermo number nine then whipped in a beautiful cross right into Vazquez’s path. Just as it looked as though Vazquez would head at goal, he spotted Rigoni, and beautifully adjusted his header towards his teammate, who was left with a simple finish. The balance and deftness of touch shown by Vazquez was almost surreal. The goal yet again was another example of how influential the Dybala-Vazquez combination really is. In a somewhat ridiculous stat, the pair have now scored or assisted 33 of Palermo’s 37 goals this season. Another aspect of his game which can’t escape mention is the way he masterfully pauses/delays his passes while he waits for a teammate to get into the perfect position to receive his pass. It’s phenomenal and, as Jonathan Wilson points out in his fine article on Ricardo Bochini, only players with unbelievable vision and smarts can execute this. It’s little wonder Juventus are reportedly keen on acquiring his services. Moreover, with Italian heritage, national team boss Antonio Conte is apparently looking into the prospect of calling him up. Playing for Italy would make sense, for Argentina’s side is already jam packed with attacking talent, plus he wouldn’t have to embark on the long journeys back to South America that can be so physically and mentally draining. Speaking on the issue he said: “I’d have no problem with it at all. 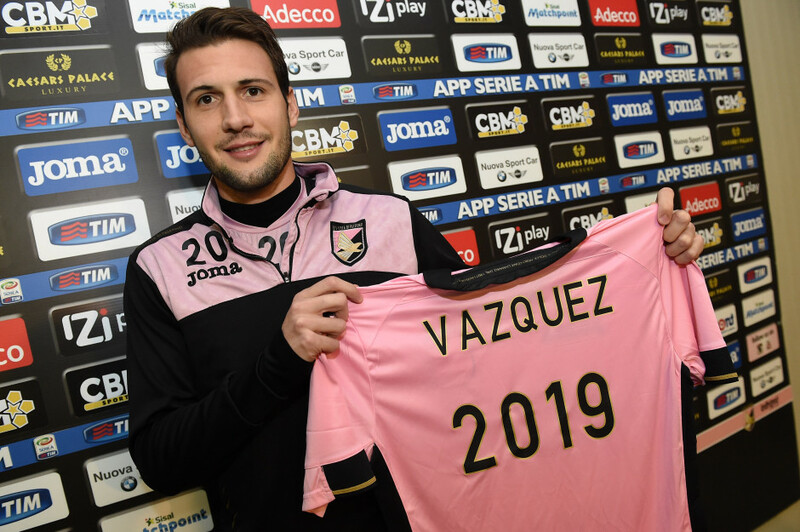 Vazquez’s agent, who’s been with him through his early struggles in Italy, which included an underwhelming loan to Rayo Vallecano and not being picked by Gennaro Gattuso when he was in charge at Palermo, explains things well. “Franco has grown so much at Palermo. He needed to acclimatize and to be trusted, and he has that now and it is paying off,” Fernando Cosentino said. All it took was for Iachini to take over – a man who believed in him – and since that moment, Vazquez, who was excellent in Serie B, has now translated, and even surpassed, his second division form, as he continues to take the top flight by storm. Intriguingly, he enjoys building Lego sets in his spare time, as per James Horncastle’s article. “I’ve got five of them. A police station. A fire station. The leaning tower of Pisa. One of those articulated lorries that carries cars, and a motorboat. That’s the one I enjoyed most. There were hundreds of pieces,” he said. This season Vazquez has undoubtedly been one of the stars of Serie A, and with his partner in crime Dybala in tow, the sky really is the limit for him. Only time will tell what sort of a career he will construct for himself, but if it’s as successful as his Lego building exploits, we can rest assured it’ll be something very, very special.